The Android operating system's share of the global tablet computer market has risen sharply at the expense of Apple's iOS, research suggests. Android accounted for 39% of the market in the final three months of last year, up from 29% a year earlier, Strategy Analytics said. Apple's share fell to 58% from 68%. Microsoft's share stood at 1.5%. Shipments of tablets reached 26.8 million in the quarter, up from 10.7 million a year ago. 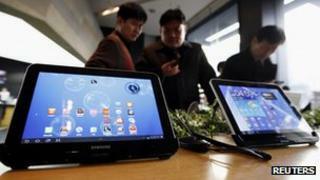 "Demand for tablets among consumer, business and education users remains strong," said Strategy Analytics' Peter King. Apple shipped 15.4 million iPads between October and December. That compares with shipments of 10.5 million tablets using Android. For 2011 as a whole, shipments hit 66.9 million, up from 18.6 million in 2010. Android is used by a number of tablet manufacturers, including Amazon and Samsung. It is also one of the most-used operating systems in the global smartphone market, although the latest figures suggest Apple has overtaken Android in the US. According to figures from Kantar Worldpanel, Apple took 44.9% of market share in the US in the 12 weeks to 25 December, compared with 44.8% for Android. Last month, the 10 billionth app was downloaded from the Android Market, and some analysts expect the operating system to overtake Apple in terms of app downloads in the coming months.